A warning for those considering the ebay kit - Miata Turbo Forum - Boost cars, acquire cats. I got the ebay turbo as an xmas gift from my fiance, I'd rather have had one of those ugly sweaters. It was not worth spending the money to return it. (would have cost me over 150 bucks to send it back and eat their 15% restocking fee) I'll just spend the cash on the FM manifold and downpipe and use the intercooler and turbo. Turbo no hit block, hit everything else. This kit I can honestly say is the biggest turd you could spend 500 bucks on, hopefully anyone searching for the ilovetacotaco kit will see this and NOT give them their money. If the picture isn't enough detail, the manifold interferes with the coolant pipe, if you have P/S if just baaaarely misses one of the hoses and don't even get me started on their downpipe. I honestly wonder how many people have actually got this on their car with zero fuel management as I don't think you could fully install it without at least some knowledge which might explain why you see so many of them on CL unused. I figure a warning with pictures showing that the kit fails on just the install is more then enough, I don't even want to think about it cracking. Time for a new fiance? FYI all the other kits also interfere with the coolant pipe, but yeah, what a turd. 4 years here and you still attempted to install it? Installing this thing will be a waste of time. The manifold might last a month, same with the downpipe. The turbo.. check to see if its glued together. I say what the ****. If you're stuck with it and you don't mind turning a few wrenches it's a fun afternoon of gaining perspective. If the junk somehow fits up and runs, see what it takes to break it and toss it. The IC should catch any big chunks of impeller, right? And props to the OP's chick; While uninformed about her purchase, she did buy the cat a turbo kit for christmas. Points for the spirit of the thing. This is the kit I started with, before I was a member on here. I had zero fitment issues with this kit, except for the fact that I had to fab up a downpipe. 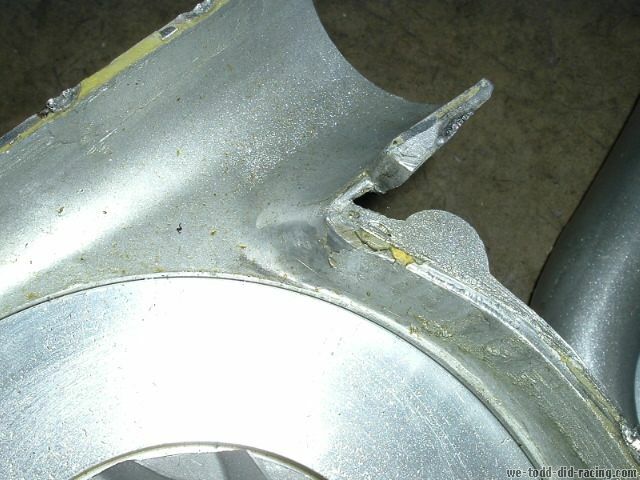 Only issue I had was the manifold (which is made of the thinnest, cheapest grade of stainless steel known to man and welded by a 6 year old in a sweat shop) cracked, and the ball bearings flew apart inside the turbo's chra and caused the turbine impeller self port the turbine housing. If this manifold would've been made with quality products, and the turbo wouldn't have disintegrated after 200 miles; this would've actually been a decent setup. Glued together turbo is magnificent. You would think that since the failure rate for the paper thick manifolds is near 100%, after a few years the distributor feedback to the manufacturer would be "make 'em just a bit thicker so they last at least a few thousand miles" but I suppose they sell enough to not care. Last edited by Handsome Greg; 01-04-2014 at 11:31 AM. Reason: glaring mistype made brain hurt. China don't care lol, its cheaper for the seller to replace the item and throw it away then return it normally if they have 1 out of 10 sold returned. Plus you can write them off on taxes without returning them to china, so if most of these items fail outside of their warranty period they are turning profit. I guess so! quit spamming the forum with useless posts. least of your worries. I'd rather parts be touching/interfering than a manifold that cracks after use. bending the coolant pipe isn't a big deal and clocking the turbo to make your IC piping isn't either. The ic piping you can either do with the bends and couplers or take it to a fab shop to have the aluminum pipes welded up so you only have 4 or 6 couplers total. Considering there is a huge user base of chinachargers on this site (including myself), posting one of the first turbos to come on the scene back in circa 2002 or so, from a company that it no longer in business, and an "issue" that's not an issue is a bit of a stretch. You think i'm trolling about some companies selling glued turbos dont you? No sir, that turbo is in fact real. We all know it's real. It was all the headlines across forums over a decade ago. He's saying that isn't an issue currently, or any time in the last couple years. no, but im saying if you are going to poke fun at chinacharger, poke at a legitimate issue, not one that's a decade old and is not a real issue anymore.